Barcelona, 12th of March 2012 – ADELTE, the world leading designer and manufacturer of sophisticated Passenger Boarding Bridges (PBBs) for cruise and ferry terminals, will design, manufacture and install five PBBs which will operate at the new Kai Tak Terminal designed by the well-known architect Norman Foster. Along with the promise of spectacular Norman Foster architecture, ADELTE is designing some of the largest and most modern PBBs ever supplied. Indeed, each one of the Passenger Boarding Bridges will allow docking from the biggest to the smallest cruise ships and each will have five tunnels with a maximum slope of 1:12 with intermediate landings which increase comfort and ease the way to disabled passengers. Moreover, in order to achieve a green design, these PBBs will also be the first ones equipped with external lightening supplied by their own solar panels. Finally, safety and efficiency will be totally guaranteed as ADELTE designs cabins that perfectly follow the vessel’s movements and will immediately undock in the event of an emergency. 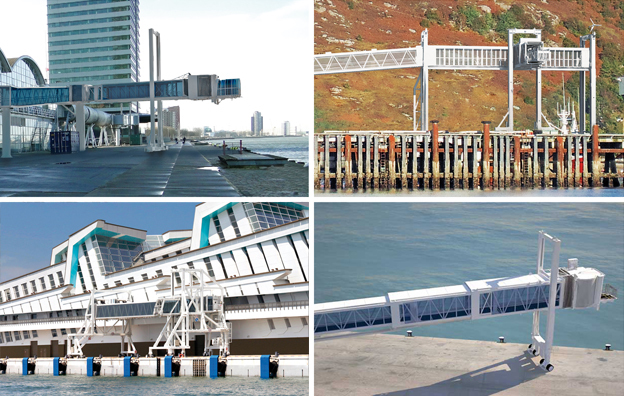 ADELTE’s Passenger Boarding Bridges also enable optimal logistics operations at the terminal. They do ensure a continuous flow of the cruise guests and allow for continuous truck, equipment and supplies traffic on the quayside. The units will be transported fully assembled from Barcelona (Spain) to Hong Kong, becoming the biggest units ever transported in this manner. The first three units shall arrive in Hong Kong at the beginning of 2013. Jordi Floreta, ADELTE Managing Director commented: “We were delighted to win the competition for such an important project that will establish Hong Kong as a major cruise hub in Asia and reinforce ADELTE’s leadership in the region”. All the elements are conceived in order to ensure that every cruise guest journey starts with a safe and comfortable boarding.